By all means Fox wants the Yankees -- preferably against the Dodgers. That would make for a high voltage World Series even in disinterested baseball markets such as D-FW, where ratings for the preliminary playoff rounds on TBS typically have scraped bottom. Fox got stuck last year with a rain-soaked five-game World Series between the victorious Philadelphia Phillies and Tampa Bay Rays, who had less tradition than the Memphis Grizzlies. The result was the least-watched Fall Classic in history, with an average of 13.6 million viewers nationally. This year's worst case scenario -- Minnesota vs. Colorado -- already has been avoided. And although they can't publicly admit it, Fox executives also are happy to see the Rockies on the ropes after last night's loss to Philly at frigid Coors Field. The Dodgers will play the winner in the National League Championship Series, scheduled to start Thursday on TBS cable. And the American League Championship Series begins Friday on Fox, with the Yankees vs. the Los Angeles Angels. Nielsen Media Research has been computing total viewer ratings for the World Series since 1973. The record-setter for that period is the six-game 1978 Series between the winning Yankees and the Dodgers. It averaged a towering 44.3 million viewers. A Series audience of that magnitude is a virtual impossibility in today's sprawling TV universe. But Fox certainly would settle for half that crowd, and Yankees-Dodgers just might be the ticket. It would mark Dodger manager Joe Torre's return to the Bronx after leading the Yanks to four World Series titles. 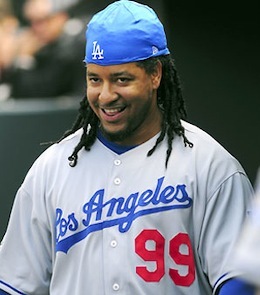 Throw in Manny Ramirez, too. Envision the reception he'd get from Yankee fans after tormenting them in his past life as a semi-crazed Boston Red Sox slugger. 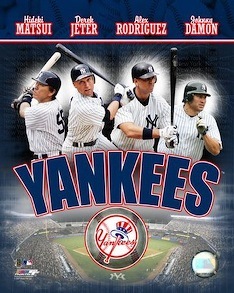 The Yankees of course are baseball's marquee team, with a multi-millionaire roster including Derek Jeter, Alex Rodriguez (still in search of his first World Series ring), Mariano Rivera, Mark Teixeira, C.C. Sabathia, Johnny Damon, Jorge Posada, Hideki Matsui, etc. There also are the storied Yankees-Dodgers Series of the past, with New York's Don Larsen pitching a perfect game in 1956 and Reggie Jackson hitting three home runs in 1977's climactic Game 6. What Fox definitely doesn't want is a Series minus the Yanks. Worst case scenario still in play: Angels vs. Rockies. Second worst: Angels vs. Phillies. The Yankees are looking like a freight train, though. Even A-Rod is hitting in the clutch. And Friday night's ALCS opener between New York and the Angels likely will draw three to five times the crowd of Fox's current lineup -- Brothers, 'Til Death and Dollhouse. Also of note: Baseball hasn't had a seven-game World Series since the Angels win over the Giants in 2002. And three of the last five Series have been four-game sweeps. Extra games build extra drama and revenue, and Fox is overdue for some. The network would turn cartwheels over a Game 7 in the Bronx between the Yankees and Dodgers. But first things first. The Angels aren't patsies. And the defending champion Phillies, presuming they close out Colorado, won't be an easy mark for the Dodgers. Play ball. Meanwhile, Fox will try to resist making any deals with the devil. Damn Yankees? Damn straight.